this is more likely a question, than issue. I have been able to flash ESP on this board with ESP-Link. It works correctly I can configure the ESP, but I want to use it for OTA for Arduino. I had switched the dip switch to correct position PIN 1,2 ON, others OFF. In the ESP-Link home page, the pin assignment is not used. 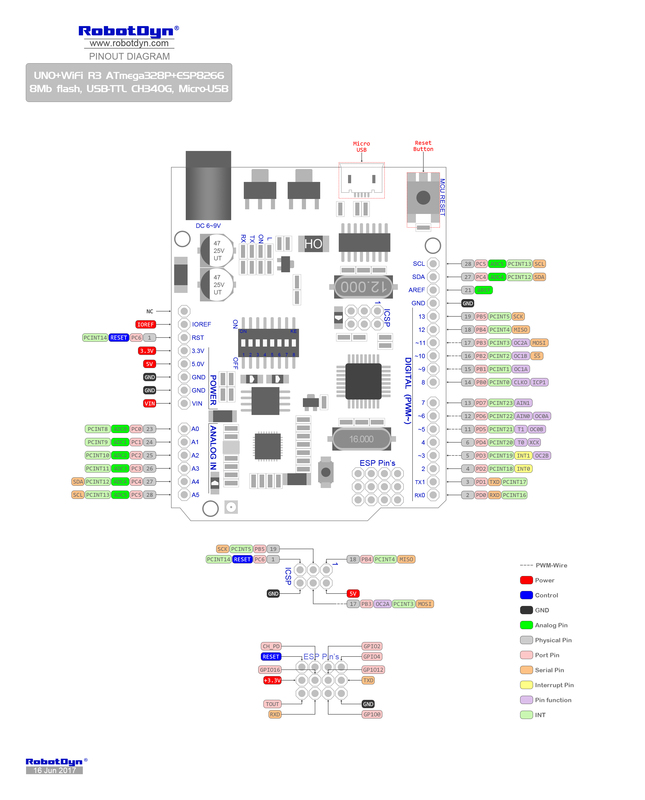 Only the ESP TX0/RX0 is connected to Mega 2560. If you want to use the reset pin, you have to connect the ESP GPIO to Mega 2560 Reset pin manually. But I have tried almost every ESP gpio pin connect to reset pin on UNO, without any luck. Can you guide me, what am I doing wrong? I am the author of the blog you have mentioned. I do not own an Uno-ESP as mentioned in your question but a Mega-ESP board. I did not manage to get OTA to work on this board. On the other hand, OTA can work on ESP01 and Pro Mini configuration. thanks for your answer. I just found out this board home and foud out ESP-Link project which is totaly awesome and wanted to combine those 2 things together to get my job done. As far as I can remember statement from RobotDYN, the Mega and Uno should be the same thing (except that Mega is using different serial). I have a bought a lot of ESP-01 for simpler sensors so i can use one of these for this thing, but lately I had discovered diferent board (ESP-WROOM32) which is far more better for my projects, thanks to 18 channel ADC, I will try to play with this. Thank you again, when I will have a little time I will try to play with it a little more. BTW, do you know how to connect an external antenna to this board? it has a hole for external antenna but do I need to unsolder any "0" ohm resistor as in other ESP07 board? I was in communication with RobotDYN, I had layed the question (hope correctly). I had seen, that there is possibility to connect external antenna for ESP8266. Do I need to unsolder any „0“ ohm resistor as in other ESP-07 boards? And their answer is here, hope it would be helpful. Need to remove this is L2 induction. Thanks for the useful information. I will try out and let you know if it works. After I have unsoldered L2 and connected an external antenna, the signal strength seems to improve by a few dB and connection is more stable. Thanks @DJManas for the information. You are welcome and thanks for testing. with Mega+WiFi there is a problem with Mega. The build-in flashing is for 328p.